Also known as the Torch Ginger, Red Wax Ginger and Pineapple Ginger, Tapeinochilos ananassae (syn. Tapeinochilos queenslandiae) is found from North East Queensland to New Guinea and Indonesia in rainforest areas. It is grown mainly for the flowers, however the foliage also adds a tropical look to the garden, and if you are growing this plant, you probably are in the tropics. Use it underplant taller growing plants and allow it to form a natural clump. You will be rewarded year round either with the foliage or the flowers. The highly ornamental flower stem emerges before the foliage in a strong stem which makes this an excellent cut flower. Foliage emerges later and will reach over 3m in height. This is a species that requires a tropical climate and constantly moist humus rich soil. Tapeinocheilos ananassae can be grown in sub tropical areas if in a warm position with adequate water. Also known as the Indonesian Wax Ginger. Easiest by division of the rhizomes of established clumps. Propagation is also from seed sometimes found for sale online or best from rhizomes from reputable suppliers. Height – Will reach 2 – 3 metres in height. Flowering period – Year round in good conditions. Foliage – Mid green broad and strap like. 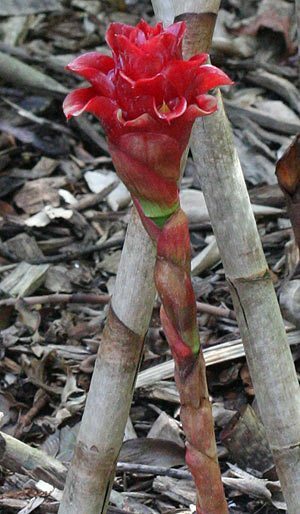 Flowers – Appear on terminal leafless shoots, bright red and closer to the ground than the foliage..